The Houston Astros will begin their quest to repeat as world champions when their ALDS series against the Cleveland Indians begins on Friday. This series will bring together the last two American League champions. However, these two teams have not met in the postseason either of the past two seasons. The Astros will no doubt enter this series as the favorites after winning over 100 games this season. But the Indians pose an interesting challenge for them and should not be overlooked. It’s somewhat surprising, but the Indians have actually been the better offensive team this year. While the Astros have been strong offensively, they haven’t been as explosive as last season. The likes of George Springer, Yuli Gurriel, and Josh Reddick have all seen their numbers drop considerably from last season. Carlos Correa has also struggled since returning from the DL with a back injury. Only Jose Altuve, Alex Bregman, and Tyler White posted an OPS over .800 this season. To be clear, the Astros can still score runs, but not like they did a year ago. The Indians are in a little better shape offensively behind the trio of Francisco Lindor, Jose Ramirez, and Michael Brantley. Those three have been outstanding this season and look capable of carrying Cleveland more so than the hitters in Houston’s lineup. The Indians also have several players who are constant home run threats, most notably Edwin Encarnacion, Yonder Alonso, and the newly acquired Josh Donaldson, who’s a huge X-factor in this series. Both of these teams have outstanding rotations, but Houston’s rotation may be a little better. The difference between the two is depth. With Trevor Bauer only just coming back from a stress fracture in his leg, it’s unclear if he’ll be in the rotation and whether he can recapture his midseason form. Even with Corey Kluber set to start two games and 17-game winner Carlos Carrasco the no. 2 starter, the Indians lack the kind of depth in Houston’s rotation. The Astros will roll out four outstanding starters, at least three of which could be the no. 1 starter on a lot of teams. Dallas Keuchel and Charlie Morton are the no. 3 and no. 4 starters in Houston’s rotation, which speaks to how good it is. Those two will also provide a good change of pace for Houston’s two hard-throwing aces Justin Verlander and Gerrit Cole. The duo of Verlander and Cole has been a little better than Kluber and Carrasco this season, giving the Astros a slight edge over the Cleveland rotation. Cleveland’s bullpen has been a catalyst for postseason success the past couple of years, but it’s been a problem area for the Indians this season. Part of the problem is that the Indians don’t have a set pecking order late in games. The trio of Cody Allen, Brad Hand, and Andrew Miller will handle those duties, but their specific use will depend on the situation. The Indians are also a little lacking in depth from past years. With Dan Otero having a rough season, the Indians will have to rely more on guys like Shane Bieber, Oliver Perez, and Adam Cimber. Houston, on the other hand, had the best bullpen ERA in baseball this year. Roberto Osuna is 12 for 12 in save situations since being traded to the Astros. Hector Rondon also gives Houston an ideal setup man after spending part of the season as the closer. The Astros will also have Lance McCullers Jr. in their bullpen during the postseason. Despite some elbow problems late in the year, McCullers has been great since his return and was huge for the Astros in the postseason last year. He figures to be an asset again this season. Pitching is still the name of the game in the postseason. 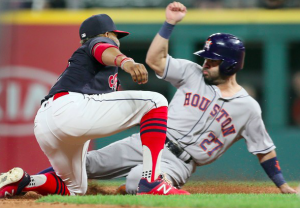 Even with a more dangerous offense, the Indians don’t have the bullpen to match up against the Astros, something that would have sounded insane at this time last year. The Cleveland bullpen is bound to give a game away at some point, which could end up being the difference in the series. Houston wins in five games.